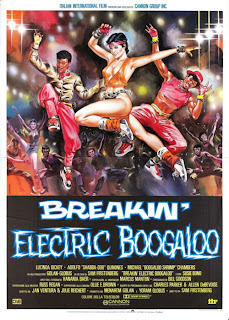 Kelly, Turbo and Ozone are back in Breakin’ 2: Electric Boogaloo, the only breakdancing-based sequel in movie history. This time around, a community center named Miracles is at stake. A nefarious land developer, Douglas (MacLean), wants to bulldoze the beloved property to make room for a shopping center. The kids can save it, but they must raise the proper amount of money. And there’s only one way to do that: dance, dance, dance! Do you know of another way? All the same colorful costumes and funky tunes return this time around as well, as does Ice-T, wearing one of the best outfits of his career in the first scene he appears in. We also find out that Kelly comes from a wealthy family, and, when she gets the opportunity to star on the stage in Paris, or help out Miracles, what will she decide? 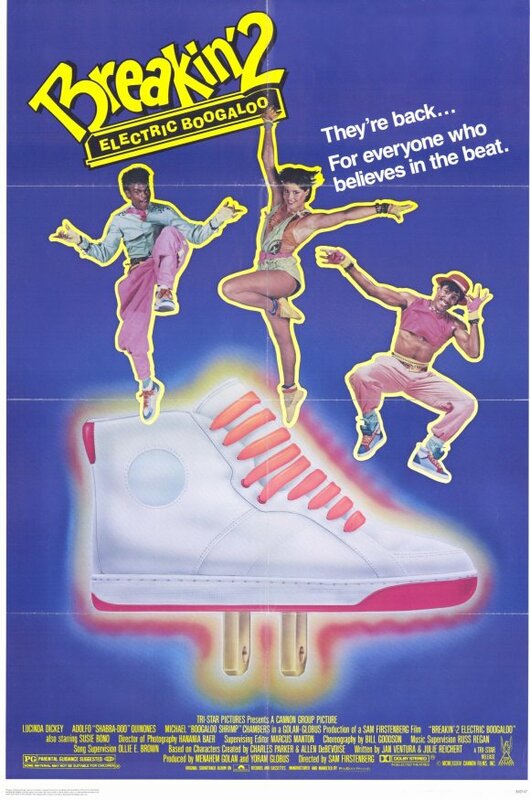 For this Breakin’ film, the directorial reins were handed over to Sam Firstenberg, the Cannon mainstay and director of many action films, including Revenge of the Ninja (1983) and American Ninja (1985). Under his watch, this film becomes more of a traditional musical, with clearly-defined “numbers” wherein setpieces are set aside for that purpose, then the action of the film goes back to normal. Luckily, this leads to insane and very funny scenarios, not the least of which are the killer opening scene and the hospital scene. Coming off Turbo’s “broom dance” in the first film, we here have him doing a very impressive, pre-Lionel Richie dance on the ceiling. Is it now to be inferred by the viewer that Turbo has magic powers? He’s certainly more of a human cartoon than ever before, enhanced by his Woody Woodpecker-like mischief, which he is definitely aware of, and it even gets him into trouble during the infamous “I stole your lunch” sequence. Ozone is still dealing with his anger issues, although the viewers’ hearts will be warmed with the increased screen time of cute little kid Hot Dog. 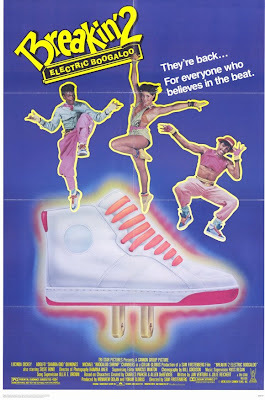 This movie is more fantastical than the first Breakin’ (1984) film, and the decision to step away from realism shows that the filmmakers wanted to change things up and not do the same thing twice. It has a more clearly defined plot than the original installment, and any fan of upbeat, fun, silly entertainment should love it. 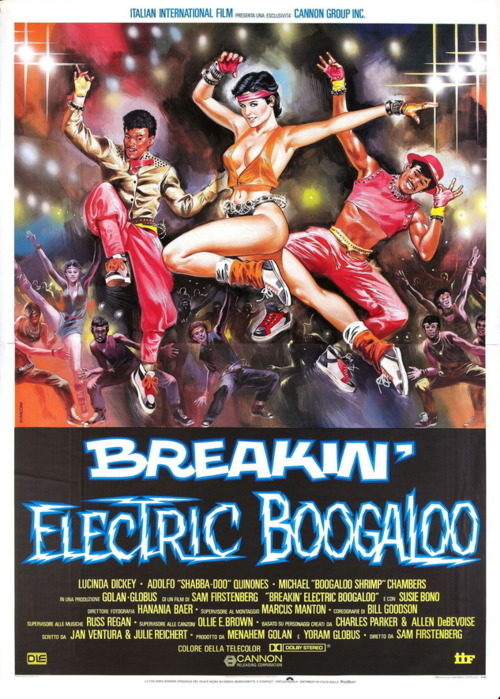 For fans of musicals and 80’s nostalgia alike, this is a sequel that is definitely worthy and makes a great back-to-back double feature with the original Breakin'. Forgot about Ice-T's crazy outfit - I'm amazed it didn't permanently injure his street cred. Haha, good point. Ice-T's street cred is now destroyed with his reality show. Always thought that was weird. I wonder what real cops think of him? Only have seen the ads for the reality show, but it looks pretty bad. Ice-T has such recognizable delivery. From the early 80's up until the present day - just check his classic line from Law and Order SVU: "You're on the down low DUDE." (you have to read that in an emphasized Ice-T voice to get the full effect). Pressure from the authorities (ie - my employers, the local school board) have forced me into hiding once more - Michael Van Zant is now Dr. Algernon Blacksteed. Yes, it's true - schools frown on R-rated blogging. That is a great name though! I haven't seen this one in forever. It's a classic, and the go to mock sequel title. I need to check it out again. Excellent stuff. Thanks! Definitely interested in your opinion on it, DTVC!